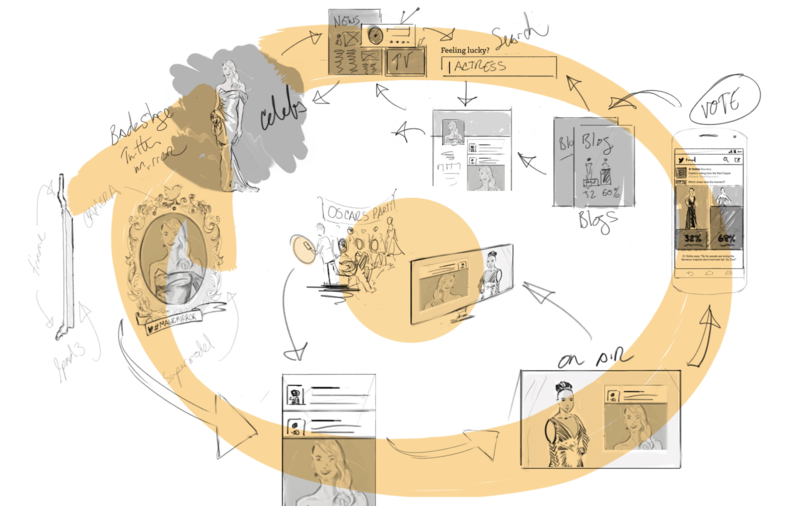 Where does storytelling overlap with experience design? If you ask James Buckhouse, these crafts are one and the same. James is the founder of the Sequoia Creative Lab. There, he and his team apply story-driven design to products and experiences for Sequoia and its portfolio companies, during what his team calls “pivotal company moments”. It’s also home to a renowned design fellowship program. James honed his storytelling skills by spending nearly a decade as an animator at Dreamworks, where he helped shape the Shrek and Madagascar franchises, among others. Eventually he found his way to Twitter as a Senior Experience Architect before linking up with Sequoia. I hosted James on our podcast to learn more about how he’s applying storytelling to his design work at Sequoia. We cover what film can teach us about building products, exercises your team can do to uncover your own product’s story, how to get technical teammates involved with the storyboarding process, and much more. If you enjoy the conversation check out more episodes of our podcast. You can subscribe on iTunes or grab the RSS feed in your player of choice. Below is a lightly edited transcript of the conversation. Stewart Scott-Curran: James, welcome to the show. Before getting into tech in the typical sense, you spent nearly a decade working on animated features at Dreamworks. What did the arc of your time look like there? James Buckhouse: I worked on all the Shrek and Madagascar movies, and I started out in special effects there. I had a company called PDI, which was one of the earliest CT houses – I think it was started in 1980. They were bought by Dreamworks and became PDI-Dreamworks. And when Dreamworks made the shift from hand animated cartoons to CG cartoons, I started working there. I started working in a group that’s a combination of cinematography and choreography, called layout. My particular subgroup of that was called rough layout. And rough layout was a place where you’d do the first pass, before the other animators got it but after the storyboard artists had worked. That’s how I started. Over the course of a decade, I developed a specialty for a few things. One was that I would dip into the art department to work on costume and visual design. And I would dip into the story department to work on story arc and jokes, specifically this thing called, “punch up.” Say a film is going along, it’s fine, and then it’s dull. You can’t really change the arc of the characters, and you can’t change where they’re going and what they are doing, but you need something to make it better. Some of us would get into a room and do a punch up session to find that thing that would find the audience’s attention again. It wasn’t just about making jokes funny, and it took me a little while to figure out what was actually good in story there. What was good wasn’t just having a character behave how the character ought to behave. Nor was it doing something that the audience doesn’t expect. It was about figuring out the emotional state of the characters as they entered the scene. Then, finding a way to transform them from that initial state to some other state by the end. So, if Shrek walks in happy, the scenes not over until he’s unhappy. If Shrek walks in sad, the scenes not over until he has hope again. Everyone’s job was to find those actions, find those moments, those ideas that we could transform that character from one state into the next. some sort of complement to the human condition. We do this at the scene level, the sequence level, the act level, and over the course of the film, too. If ever we brought in a second character, usually the they were in the opposite state. If Shrek was happy, Donkey would be unhappy. If Shrek was unhappy, Donkey would be happy. Both would transform to the opposite state, and then back again, and back again, so you always have this contrast of emotional states between scenes. If anyone was ever on the same page, like if Shrek and Donkey were both happy, then you bring in a third character like Puss in Boots. You’d always have a contrast between emotional states, which, weirdly, is exactly what we’re doing when we’re designing products. We’re never just designing features. We’re never designing just a new user flow. You’re never designing just a sign-up form. You’re never designing just a way to share. You’re never designing just pixels to click. You’re always designing some sort of complement to the human condition that takes you from some initial state to a transformed state. At least I think you are, if you’re doing it right. Stewart: What was the pull for you to move from working on those animated features, to something more product focused? James: We’re kidding ourselves if we think we’re just designing the UI inside the screen on our phone. There’s always a person on the other end of that UI, and that person is going through something. They’re riding on the bus and thinking of their aunt. Or, they’re in line at the DMV. Or, they’re just back from work, figuring out what to have for dinner. Or, they’re in the middle of a town square when the tanks roll in, and they’re finding some way to share with the world what’s happening right in that moment. There’s always some sort of story that the human involved is going through. I’ve always thought of design as this long, interwoven story of a person’s daily life, and a person’s every moment. And the things that we make are multipliers, augmentations to that. Directly how I got in though was by punch up. I had a brief period where I became a ghostwriter for every C-Suite up and down Silicon Valley. I was writing jokes, character arcs and summer-blockbuster-style stories, but about products and the arcs of companies. That led me to meet a bunch of different companies, including Facebook, YouTube, Google, HP and many more. Finally, I met the team at Twitter and did some writing for them, and then joined Twitter’s team in this combination role of story and brand. Then, I quickly transitioned into helping the company think about where their product ought to go, not where the product had been. When I left there, I was the experience architect, and my job was essentially to storyboard experiences for events, like the World Cup, or the Oscars. To tell the story of the product, but more importantly tell the story of the people who use it. 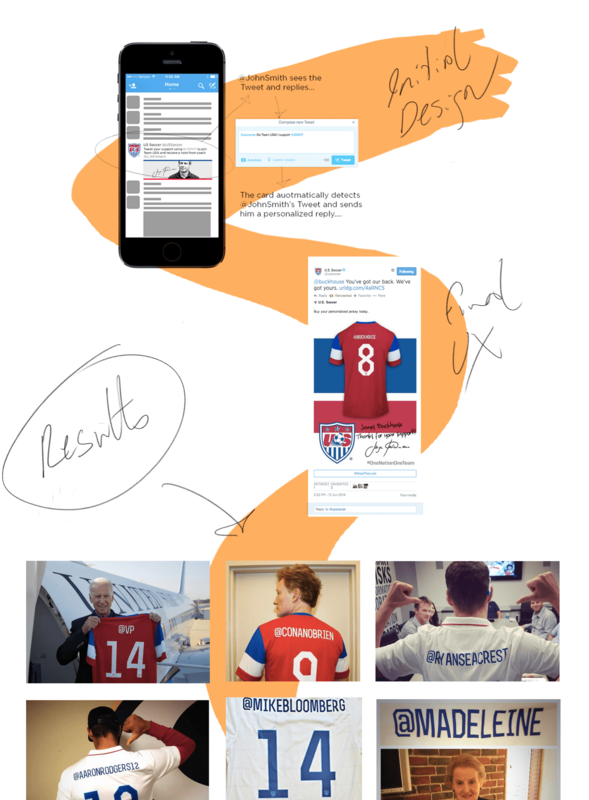 A story map that James created at Twitter for the World Cup. Read more about his process here. Stewart: Today, as founder of the Sequoia Creative Lab, you talk a lot about using story-driven design, and storytelling to help create great user experiences. Storytelling is a term that you hear bantered around quite a lot, but I’m not convinced everybody understand what we’re really talking about when we’re talking about storytelling. What do you think that term means for a startup or a product team? James: First of all, the word drives people crazy. There’s no faster way to make people actively ignore you and hate you for no good reason than to tell them you’re a storyteller. It inspires this level of mistrust and hate that is fascinating. Yet, without story we have no mechanism by which to generate a machine inside the minds of others that does positive work on our behalf, and on behalf of the planet. The story is what motivates us. The story is what helps us find meaning in not just our momentary actions, but in our long-term actions. Things are worth it for us in the end because of story. Story is quite directly the light at the end of the tunnel that pulls us through difficult times. Story is what helps interns get through medical school. Story is what helps designers push in that final moment when they’re tired and they don’t want to continue to ask the tough questions that are going to get a better result. Story is what drives our democracy, when we do it well. Story really matters. But storytelling, that’s something that instantly fills people with mistrust. I like to separate the architecture of story, a conceptual machine, from the art of storytelling, which we need a different word for. Quite honestly I think that different word is experience design. That’s where you’re actually doing your storytelling. That’s when you’re showing people what you mean, what matters, what you care about, and why something is important. Stewart: How do feel some of the work that you did in film carries over to what you’re doing at Sequoia? Has that influenced the way you think about a product design process? James: Totally. We have process called the Product Experience Matrix, which combines a couple of things that designers are probably familiar with, but it does it in a new way. One is, you start with personas, and you map out the personas. Those personas are the character in your movie. Let’s choose an example like DoorDash. You’ve got people at home who are the diners trying to have their meal. You’ve got people who are the drivers. You’ve got the person who runs the restaurant. 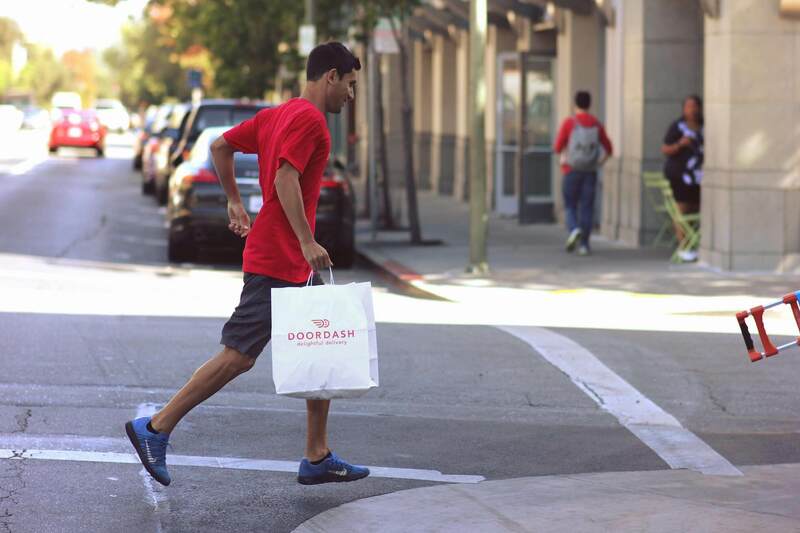 You’ve got the quality assurance person back at DoorDash headquarters, who’s helping solve problems. These are all characters in your film. Each one of those characters is important, and each one of those characters is going through an arc. So, like a novelist or a filmmaker you would write out the story of each one of those personas. Then, we would actually storyboard that. We would draw it, so you would see what that looks like. Characters in the “story” of DoorDash include diners, a delivery Dasher, restaurant staff and customer support. Lots of people have personas, and often times people will storyboard. The new thing that we do is align those stories, stacked on top of each other, then we look for shared experiences. Whether it’s DoorDash, a B2B company, a SaaS company, or a consumer company, you look for those shared experiences, and you look for how your product is serving each and every one of the personas, or each one of the characters in those shared experiences. You learn fascinating things. For instance, you would think the dining family back home has nothing to do with the story of when the Dasher is inside the restaurant. But of course they do, because the family is back there wondering, “Is everything going alright with the meal? Is this going to work?” You’d think the restaurant has nothing to do with the experience once the Dasher has finally delivered the meal and the family is happily eating. But of course the restaurant has a role there. They’re wondering, “How’d that go? Was that a positive extension of my brand? Have I suddenly expanded my number of table tops to an infinite number because of this service?” They want to know. The same thing is true for a consumer app, an enterprise service, an app or a platform. So how do we directly apply storytelling from filmmaking to product design? We do it through this product experience matrix. Stewart: In a recent a how-to guide for content that you created at Sequoia, you advised to, “persuade with emotion, but justify with logic.” That applies not just to content, but when presenting design too. How do you think designers can improve their storytelling skills, particularly when it comes to presentation? What would you encourage them to do differently or better to increase their impact? James: That’s a great question. Let’s think about the process that doesn’t work. What doesn’t work is when the truly talented and brilliant designer goes off, designs a solution, finds an answer and the answer is good. That answer took work – weeks, maybe months – and hundreds of iterations to get right. But no one else was part of that; they were off on their own. Then, here they go to present the results. They walk into the room and say, “I have the answer, behold.” How’s that going to go? Always terrible, because it explains to those listening that their job now is to find holes or problems in the solution. That’s a terrible relationship. You want a relationship much more like improvisational theater, or jazz musicians, or people that know how complement the other person’s actions with actions of their own, to create something worth having. Where you’re bringing people along through the journey, not just by giving updates, but by involving them in the problem-seeking process. What is the pain that we’re finding together in the world? And how do we think we can attack it? At the very beginning of a design project, I would find the engineering lead, and the product lead, and the design lead – or if I was the design lead I would be there. We’d have a sheet of paper and we’d talk about the problem in the world. I would take out a pencil and I would make the smallest mark I could on the page, like a circle, and I’d say, “This is the user.” I’d hand the pencil to the engineer, and ask, “What are we trying to do?” As soon as you can get the engineer to draw on the paper with you, and you can literally draw together to make a solution, everyone’s invested in co-creating this thing. This is a process we did at Dreamworks when we were storyboarding, but it’s a process I first saw in product design with Josh Brewer at Twitter. It works so well. When we were at Dreamworks we would do it where you would be telling jokes, and everyone’s shouting at the same time, when you’re writing jokes. You’d have pads all over the table, and we only drew with Sharpie’s. They’re so dull and flabby and gross that you can’t do a finicky drawing. If you can only do a bold drawing, you have to commit to doing it. You can’t erase, you’ve got to just go. The storyboarding process there involved bold, confident drawing, and it also meant that we were constantly drawing over each other’s fingers in the middle of exciting moments. The beauty of seeing Josh do that with engineers and PMs made me think, “Okay that’s a good one. Let’s do that from now on.” Have you ever done that? Stewart: We do a lot of that. Not on pads, but with whiteboards. We have big markers, and we only use one marker that we’ll pass backward and forwards between us. It’s like you’re passing the baton to somebody else. James: The trick is to not have the designer, who’s probably the best drawer, draw all the time. They should draw the least amount of the time. Of course, the designer can always go back and redraw it. An orrery-style story map that James created at Twitter for the Oscars. Read more about his process here. One of my very favorite words from old-timey science is orrery, a model of the universe the way you best imagine the universe to operate. You can be wrong with an orrery, but the point is to have a model, and not just a mental model, but a physical manifestation of your mental model, so we can all talk about it. The way that I tried to reinvent how we could combine storyboarding from film with story maps from product management, with a story map that the whole team could rally behind, was to draw these orreries that showed all the interconnected parts of the planet, of your solar system you’re building, of all your products, the interconnect part of your products. Draw how those might flow together, but not all the way down to what the actual informational architecture would be, or the actual product flow. But enough that you could feel the emotional transformation that would occur for the person who went through that experience. Stewart: Thinking about the experiences you help your portfolio companies design at the Sequoia Creative Lab, you typically help your companies during what you call “pivotal company moments.” How would you describe and identify those pivotal moments? And what are some of the most common challenges facing a startup during those times? James: Whenever I’m lucky enough to actually get to work with something as precious to a founder as their own product, I go into it with the humility of knowing that they undoubtedly already have the answers. Often my job is to help listen to everyone’s take on the situation, and help organize it in a way so that people can all say, “Yeah, that’s what we’ve been talking about. That’s the thing we know must fit together, but it currently isn’t.” It’s more about helping them say their own good ideas aloud, and then organizing it in a way that they can share it back to the world. Occasionally I do have an additive idea, or rarely, an original idea to contribute. Almost always, most of design is about carefully listening to the situation and then reflecting back to people what they said and how that might go together. How do you identify a pivotal moment? It’s when a company is going from one state to the next. It’s when they’re starting to grow. It’s when they’re entering a new market. It’s when they’re changing their approach to their product, or they’re launching a new product. Or, they’re thinking of the people who use their product in a different way. All those moments. Stewart: At the Sequoia Creative Lab, you host a lot of events, and design fellowships are a big part of the program. What are your broad goals there? Have you identified particular holes that you’re looking to fill, educational or otherwise, within the design community? James: Let’s think about design education right now. Design education does a wonderful job of teaching you big ideas. It does a marvelous job of teaching you specific tools. But rarely does it do a good job at giving you the experience of shipping a product. So, how do you get the experience of shipping a product if you’ve never shipped a product? 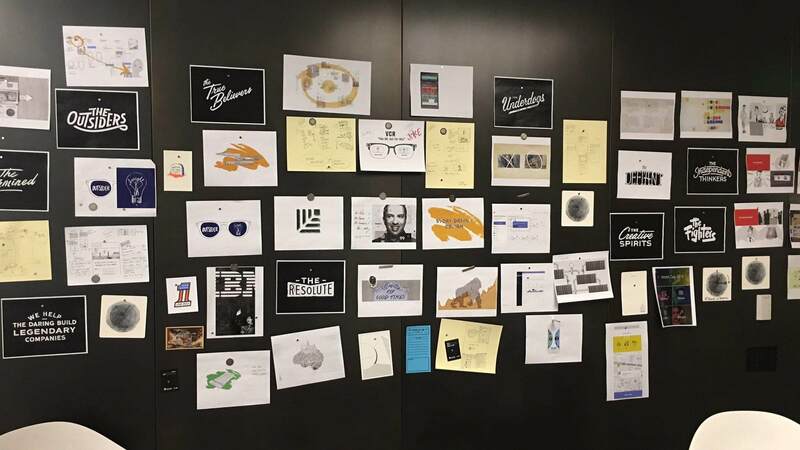 The Sequoia Creative Lab’s Design Fellow’s program is a way to take designers that have extraordinarily high potential, but not that many actual products in their portfolio that they’ve shipped, and work with them on projects within the portfolio, so that they learn through doing. This is a way to help designers get the experience they need, so they have real products in their portfolio and they can get the jobs they want. There’s a big difference between what you get paid as a visual designer, versus what you get paid as a product designer. They don’t talk about that a lot in the product design world, or in the design world in general, but it’s a big difference. It means a lot to people to be able to move fluidly between those, and we’re getting to the place now where we’re starting to talk about the full process designer. A designer that can understand research, a designer that has a visual background, that can create informational architecture. Not just designing a product, and a design system, but then also the front end experience. Part of the reason I do it is because I learn too. It’s not me teaching people. Together we learn from each other how to get better across this lattice work of different experiences, different ideas, different approaches and different aesthetics, and valuing them equally. It’s not, “I am the teacher, you are the student,” but that we together are chasing curiosity. We together are in the pursuit of excellence in all forms. We together are finding the best answer by learning from each other and finding way to augment each other’s ideas, and help each other improve where we are weak. It’s my secret weapon for how I get better, honestly. Stewart: Work with people who are better than you. That’s my trick. James: For sure, and recognize, hopefully, that each and every person you work with has something where they are much better. Stewart: Long may we continue to learn from each other. James Buckhouse, thank you so much for coming on the show today. James: Thank you for having me, and I brought gifts! Go find me, @Buckhouse, on Twitter, and I’ve got a few things for you there. There are some links to the design story map that we talked about, and the guide for exceptional content. Then, I’d love to start a conversation with each and every designer about two things. One, we are hard at work on an open source design career ladder. If you have thoughts on creating a design career ladder that you’d like to contribute to this open source project, I’d love to hear it. Secondly, I’d love to hear about the engineer to designer ratio at your company. It’s only when we start talking about this stuff that we’ll be able to know what we need to do, and how we can move forward.